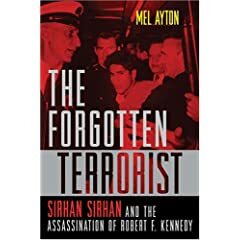 Mr. Ayton is the author of The Forgotten Terrorist – Sirhan Sirhan and the Murder of Senator Robert F. Kennedy published by Potomac Books, May 2007. He was interviewed about his new book by the Discovery and National Geographic television channels. The National Geographic Channel documentary will be broadcast in November/December 2007. In June 2007 the Discovery Times Channel broadcast a documentary, Conspiracy Test – The RFK Assassination, which relied on unscientific practices to sensationalize their story of how a second gunman acted with Sirhan Sirhan to murder Senator Robert F. Kennedy. The documentary challenged the Pruszynski Tape acoustics research carried out by two teams of experts -- Philip Harrison and Professor Peter French of J P French Associates in the UK and Steve Barber, Dr Chad Zimmerman and Michael O’Dell in the US -- for my book The Forgotten Terrorist. J P French Associates is the United Kingdom’s longest established independent forensic speech and acoustics laboratory. The company prepares reports for the defense and prosecution in criminal cases on speaker identification, transcription, authentication and enhancement of recordings, acoustic investigation, and other related areas, including the analysis of recorded gun shots, and is regularly involved in some of the most important and high profile cases in the United Kingdom and around the world. Philip Harrison has worked on over one thousand such cases. Harrison analyzed the Pruszynski Tape using three different methods, both independently and simultaneously. These involved (1) listening analytically to the recording via high quality headphones, (2) examining visual representations of the recording’s waveform (oscillographic displays), and (3) analyzing spectrograms (plots of sound energy across frequency over time), all using specialized computer software. Harrison’s findings were confirmed by Professor Peter French, a colleague and lecturer in forensic speech and audio analysis at the University of York. They found no more than 8 shots were present on the recording. Both the UK and US teams had independently examined the tape then Barber and Harrison consulted with each other. The history of how the new acoustics evidence became known to the world began, not with the Discovery Channel documentary as the producers alleged in their press release, but with Steve Barber. The Prusynzki Tape had been widely publicized in Steve Barber’s HNN article. In early 2006 I obtained from the California State Archives an audio cassette copy of the previously unreported ‘Pruszynski Tape.' It is a tape recording containing of the sound of the gunshots in the Ambassador Hotel pantry on the night Robert Kennedy was assassinated. The recording was made by Stanislaw Pruszynski, a journalist. Pruszynski informed the Los Angeles Police Department (LAPD) that he was in the pantry at the time of the assassination. He claimed his cassette recorder was running all through the shooting. It is the only recording in existence that was taken in the pantry, and it is a record of all the shots fired from beginning to end. In April 2007 I was asked to participate in a Discover Times Channel documentary about the RFK assassination. I was informed by one of the producers that the documentary would be balanced and fair. During pre-production correspondence the producer informed me that her company, ‘Creative Differences’, had hired an independent acoustics firm to analyze the tape but refused to name the company. The Creative Differences producer would also not release any of their experts’ findings because the company had negotiated a ‘secrecy’ agreement and their results were not allowed to be publicized until the Discovery Times program was broadcast. The producer was well aware that I had asked two teams of experts to examine the tape and their results were included in Steve Barber’s HNN article and in the galleys of my book ‘The Forgotten Terrorist’ which the Creative Differences producers obtained from my publishers. Their acoustics team was thus at an advantage in that they had access to J P French Associates’ acoustics report and also the results of the Barber, Zimmerman and O’Dell research. During production of the Discovery Times documentary, the ‘Creative Differences’ documentary team asked that one of the experts I enlisted to examine the Pruszynski Tape, be present for interview. I asked Philip Harrison to attend. During this period they also told us their acoustics experts had identified ‘more than 8 shots on the Pruszynski Tape.' My response was to ask Creative Differences for a copy of their acoustics report for consideration before filming. However, their analysts, consisting of Van Praag, Wes Dooley and his assistant, had not even produced a written report but had simply been filmed on camera examining the recording. Despite having grave reservations concerning the lack of any written report and also of not having the opportunity to respond to their experts’ findings, Philip Harrison and I agreed to be interviewed as we were assured the outcome would be ‘fair and balanced.' Thus, during filming, Philip was not able to respond to the Discovery Channel’s acoustics findings even though they had his report in full. The Discovery Channel documentary, as suspected, managed to provoke a dramatic media and internet response, in the main because the producers had sensationalized everything about the RFK case. Furthermore, the documentary makers skewed everything in favour of conspiracy as I suspected after first reading the press release which, as I previously mentioned, had wrongly attributed the tape’s revelation to themselves when in fact Steve Barber was the first to publicize it worldwide in an article for the History News Network. Discovery Times was also remiss in not telling its viewers the whole story about the acoustics research carried out for me. I had told their producers there had been twoteams of experts (Harrison/French and Barber/Zimmerman/O’Dell) looking at the Pruszynski Tape with a view to publishing the findings in my book The Forgotten Terrorist. I named all the contributors to the research. This fact appears to have been lost on the producers. Had the documentary producers insisted on having their acoustics team’s results examined by J P French Associates and Steve Barber’s team they would have discovered the many flaws in the acoustics evidence presented by their experts. *The program claimed that the fourth expert, Philip Harrison, wasn't using the best quality recordings and that he didn't take into account the position of the Polish journalist doing the recording. The Discovery Times narrator added, “Harrison was working from a single copy of Van Praag's recording from the California State Archives. Not from Van Praag's masters. Harrison was also not aware of the details surrounding the events of that night at the Ambassador. Most importantly, he did not know the location of Pruszynski's microphone and how it was moving when the shots were fired.” He also later claims that “with these important differences it's no surprise that Wes Dooley and Paul Pragus as well as their colleague in Denmark found more shots." These statements are misleading. It is clearly stated in the documentary that Eddie Brixen had only been provided with a single copy of the recording and there is no indication that he was given information about Pruszynski’s movements. So the relevance of this information, which was claimed to be “critical to an accurate analysis of the recording”, seems somewhat less significant as Brixen also appeared to locate more than 8 shots. *Harrison and Barber were obviously interested in the new, albeit limited, information available from the documentary and were intrigued as to the details of Van Praag’s work that had resulted in such different findings. Therefore, Harrison and Barber contacted Van Praag but he was not willing to discuss his findings in detail. Harrison then contacted Wes Dooley. According to Harrison, “Dooley revealed some interesting information including the fact they had to destroy all their files after the filming findings and that Dooley didn’t seem to consider his findings to be as conclusive as the documentary might have made out." *Van Praag did admit to Steve Barber that Creative Differences had produced their own audio level graph with 13 numbers ‘popping up’ and Van Praag had no idea who constructed it. Van Praag said it ‘in no way’ necessarily represented what his findings revealed and that the documentary makers had stooped to a low level in presenting his findings. So if Creative Differences misunderstood Van Praag’s research (even though he did say 13 shots had been identified) it is not a great leap of the imagination to assume their interpretation of Van Praag’s work shown in the documentary was erroneous. Another of Van Praag’s comments to Steve Barber following the broadcast of the Discovery Times documentary (“Until I finish sorting it [my analysis] out …..a day, a week, a month…”) is also revelatory. Van Praag thus presented his findings to Discovery viewers when, by his own admission, he had not completed his research. *Discovery’s acoustics ‘experts’ arrived at their number of gunshots fired, not by an examination of the Pruszynski Tape alone, but by also considering the location of Pruszynski and his microphone at the time of the shots. The location information appeared to be derived by synching a thump sound on news broadcast footage with the same sound on the Pruszynski Tape. According to the documentary Pruszynski was said to have walked behind the podium when RFK and his retinue left the Embassy stageand down the steps to the right of the stage (viewed from the front) and is last seen approaching the stage door that leads back in the direction of the pantry. Van Praag’s description was that Pruszynski is seen “walking down the stairs and at this point we hear a thump just as he’s beginning to enter the kitchen pantry area and we know from Pruszynski’s recording that that is the point where the shots are fired." Steve Barber and Philip Harrison were able to locate the thump, which was played several times on the documentary, on a section of news footage obtained from the California State Archives. However, this material is in color and is not the black and white footage in which Pruszynski can be seen in the documentary. It therefore must be assumed that Van Praag had synchronised the images of the color footage with those of the black and white footage and the thump sound to obtain Pruszynski’s location at the time of the shots. Barber and Harrison then attempted to locate the thump sound on the Pruszynski recording. Despite there being a few candidate impulse sounds none were similar enough to the news footage thump for them to be able to accurately determine which sound Van Praag considered to be the thump. In view of their serious doubts over Van Praag’s synchronisation Barber and Harrison contacted him again to try to obtain confirmation that the ‘thump’ that was played during the documentary was the same one he had used. However, he was not prepared to enter into correspondence on the subject. Van Praag’s description of the timing of events indicate that the thump occurs very shortly before the shots. This raises further issues in relation to the images seen on the color TV footage. There are over 8 seconds of material after the thump before there is a break in the recording. During those 8 seconds there are no indications of panic within the ballroom crowd and no shot sounds can be heard. There is a further short recording with a duration of 6 seconds and again there are no obvious signs of panic in the crowd. It isn’t until the next recording, some 14 seconds after the thump (not including time elapsed whilst the camera was not recording) that signs of panic start to become apparent. If Van Praag’s timings are correct then why did it take so long for the crowd to react? *In addition to the issue concerning the number of total shots fired, the show also said at least two of the shots on the tape were fired too closely to have come from the same gun. They even go to a firing range where a firearms expert conducts experiments using the same type of gun as Sirhan. These show that it would not be possible to fire two shots from that gun in the time required by the recording. This is presented as corroborating evidence for a second gunman when the crucial point is completely ignored -- what is the actual evidence for the second sound being a shot? Having highlighted serious concerns about the reliability and usefulness of both the location information and Van Praag’s extra copies of the recording, it is clear that the bottom line is that the differences between the findings of the analysts is simply a matter of interpretation. All of the analysts involved would agree that there are more than 8 impulse sounds in the Pruszynski recording in the area of the shots. (Impulse sounds are characterized by a sharp onset and rapid decay. They are caused by a wide range of events, for example a gun being fired, a balloon bursting, a firecracker being let off or one object hitting another.) There are, in fact, many other impulse sounds throughout the entire recording and to simply attribute other impulse sounds in the region of the shots to a second gunman without being able to provide a reasoned scientific argument is reckless. The documentary provides no information about why Van Praag considers the location of Pruszynski to be so important or how it accounts for the differences between the analysts’ findings. The same is true for Van Praag’s different recordings. More importantly no explanation is given for why the documentary’s experts discount all other possible sources for the impulse sounds and instead conclude that they are gunshots. There is also an additional danger – although Van Praag’s and Wes Dooley’s findings will be rejected by the scientific community on the basis they have not provided a written report for consideration by their peers, they have unwittingly (or consciously) provided scientifically unsupported results to conspiracists who have their own agenda in promoting an unproven conspiracy to murder Robert F. Kennedy. I hope Dan E. Moldea will address this. It seriously undermines Moldea's credibility for him to have told Mel Ayton that nobody, other than Philip Van Praag, has ever suggested thirteen shots were fired - when in fact Moldea must have known that he, himself, had suggested that very thing! Danny Moldea, where are you? Are you hiding? You simply must address this. The number thirteen is obviously not a lucky one for Dan Moldea! If you've ever wanted to know what really makes Dan Moldea tick, you probably will find no better indication of that than the following. Dan Moldea recently told Mel Ayton that "even the kookiest kook" has never suggested 13 shots were fired in the Ambassador Hotel kitchen pantry during the assassination of Senator Robert F. Kennedy on June 5, 1968. In claiming this, Mr. Moldea was taking a direct stab at audio expert Philip Van Praag. Mr. Van Praag has had the temerity to disagree with lone gunman advocates Moldea and Ayton by reporting that his analysis shows the Pruszynski recording, a recently-uncovered sound tape of the RFK assassination, reveals 13 shots were fired (five more shots than Sirhan Sirhan could have fired) and, thus, proves that there was a second gunman also firing inside the pantry. Mr. Van Praag's analysis is quite impressive and goes beyond the single issue of how many shots were fired by also addressing how the intervals between shots also reveals a second gun firing (he has even been able to pinpoint exactly which of the 13 shots were fired by Sirhan -- eight, he says -- and exactly which five additional shots were fired by the second gunman). The Van Praag analysis appears rock solid and, to say the least, historic. Getting back now to that direct stab at Mr. Van Praag. It is a thrust which Mr. Moldea obviously makes out of nothing more than sheer spite for Mr. Van Praag's having discovered something important that the egomanical but bumbling Mr. Moldea obviously had missed. We must ask ourselves: Back in the 1990s while he was going around telling everyone that he was going to personally solve the RFK murder, did Mr. Moldea ever actually spend any time at the California State Archives in Sacramento as part of his research for his 1990s book? If so, how was it that Mr. Moldea managed to completely miss the Pruszynski recording, which was there and available to him and to all other CSA researchers in the 1990s? All thumbs as usual, Mr. Moldea has managed to not only miss discovering the Pruszynski recording many years ago but he has, more recently, managed to miss his intended target Mr. Van Praag - and, in the process, Mr. Moldea has managed to stab himself instead. And draw considerable blood. As a sharp-eyed HNN reader has discovered recently, it turns out that it was none other than Dan Moldea himself who once suggested 13 shots were fired during the RFK assassination! ". . . based upon the statements of those I interviewed, there are strong reasons to believe that more than eight bullets were fired that night. In fact, current available evidence suggests that 12 or more bullets may have been fired, which is consistent with the initial FBI report on this matter." As the HNN reader further noted, "obviously '12 or more' would include 13. So here we have Dan Moldea himself, as far back as 1990, suggesting 13 shots may have been fired in the Ambassador Hotel kitchen pantry. But today we have Mr. Moldea telling . . . HNN readers that not even the kookiest kook would suggest such a thing." This gets to the very heart of who and what Dan Moldea really is. He is of course a daring huckster - a two-bit conman who sadly must convince himself that he is smarter than everyone else and can get away with anything. He is even willing to dupe his own ally, Mr. Ayton, in his desperate need to get away with outrageous deception (I wonder what Mr. Ayton thinks of Mr. Moldea now, as his reaction should be quite revealing concerning Mr. Ayton himself and his own credibility or lack thereof). Dan Moldea's RFK book in the 1990s was a testament to hypocrisy and outrageous deception. Mr. Moldea spent a good portion of his book being as scientific as he could be concerning the Kennedy murder. Then he suddenly took a leap of faith and decided - on the basis of nothing more than non-scientific whim - that Sirhan did it all and did it alone. In keeping with his outrageous ways, Mr. Moldea offered for his conclusion nothing more than pure hunch. Mr. Moldea's entire lone gunman fantasy rests upon his daydream that, somehow, a crowd of onlookers in the kitchen pantry inadvertently pushed Kennedy into Sirhan's gun and that, during this pushing, RFK's body was thus magically aligned with the Sirhan gun so perfectly as to create the results noted in coroner Thomas Noguchi's RFK autopsy (this, even though many witnesses have said that people in the pantry immediately jumped backward and out of the way when the first of the shots was fired - and no witness has ever said that there was a crowd behind RFK that kept moving forward despite the sudden eruption of gunshots). Mr. Moldea, like most conmen, must challenge us to expose him (for if we fail to expose him when he is generously providing us with the means to do that, then he can tell himself that he is so much smarter and cleverer than we, the unwitting dumb-dumbs). I believe this is precisely why he tried to deceive the unwitting Mr. Ayton and HNN readers with his "kookiest kook" comment. If Mr. Ayton has any credibility himself then he should be angered at having been used like this by Mr. Moldea and should say so publicly. It will be interesting to see whether Mr. Ayton really is angry at Mr. Moldea (I suspect that he is not and, thus, he too reveals himself). The bumbling Mr. Moldea could not find the Pruszynski recording. It was hidden in plain sight at the California State Archives and he managed to miss it completely. But Mr. Moldea has perhaps, at last, found the missing "kookiest of kooks" and it may indeed be himself. Certainly this is something that one is now obligated to consider. We're waiting. Just how do you explain Dan Moldea's hypocrisy in your article? And how do you personally view it? "Dan Moldea observed after watching the (2007 Discovery Times) documentary), '(Audio expert Philip) Van Praag has concluded - and stated on national television - that thirteen shots were fired at the (RFK assassination) crime scene . . . even the kookiest kook hasn't suggested that.'" As one reader noted, it now turns out that it was none other than Dan Moldea himself who suggested that very thing -- thirteen shots -- many years ago. Obviously "12 or more" would include 13. So here we have Dan Moldea himself, as far back as 1990, suggesting 13 shots may have been fired in the Ambassador Hotel kitchen pantry. But today we have Mr. Moldea telling you and HNN readers that not even the kookiest kook would suggest such a thing. I wonder, Mr. Ayton, whether Mr. Moldea's hypocrisy troubles you in any way? And why have you and Mr. Moldea not offered an explanation as yet? I suspect it is, of course, because you and Mr. Moldea simply have no explanation for Mr. Moldea being caught with his pants down. Dan Moldea is actually a hypocrite. You nailed Moldea good on that one! Ah, but as it turns out, it was none other than Dan Moldea himself who suggested that very thing. Care to explain this, Mr. Moldea? British author Mel Ayton tells Discovery Times Channel that he believes the Bobby Kennedy murder case "should be reopened"! Mr. Ayton calls for a new RFK investigation in the following YouTube video . . . Thank you for your ill-considered opinion of my part in the National Geographic program, CIA Secret Experiments. I consulted with the NG expert about parts of the Pruszynski Tape but as Mel Ayton correctly states they did not carry out a full examination and were unable to respond in any meaningful way to Van Praag's research because he stonewalled everyone who asked for a detailed report from him, including Philip Harrison, Michael O'Dell and myself. The NG expert found no reason to disagree with my conclusions that 8 shots or less are present on the tape. In your previous posts you have shown no knowledge whatsoever of the Pruszynski Tape nor do you have any credentials or authority to criticize my work. Your comments, therefore, are redundant. What you saw in the program is only a tiny sample of the enormous amount of work that I have performed over the past 2 years working with this recording. Simply put, you have no idea as to what you are talking about. Until you can produce your credentials as far as working on this recording, your remark regarding my work on the tape as “the biggest piece of garbage I’ve seen in a long time” is nothing but your opinion, and a worthless one at that. In this country, we all have a constitutional right to be heard, but we do not have a constitutional right to be taken seriously. 'Willis' has failed to inform readers why we should listen to him and why his rantings deserve any respect. He has made charges that I have lied about the NG experts - I now challenge him to write to the producer for an answer. But my guess is he simply won't do that as it will make him look foolish. He should also show the courage of his convictions and reveal something about his background that would persuade us he is anything other than a conspiracy nutter who loves to bandy around allegations without any proof whatsoever. I doubt that will happen as I believe he is just another blowhard who likes to hide behind a cloak of anonimity. I spent a considerable amount of time with the producer Tria Thalman. And, of course, she will confirm the NG experts looked at the tape and found nothing to persuade them Van Praag's work had any merit.If Willis contacts her at NG she will confirm this.Then Willis will need to retract his disgraceful and outrageous charges. But people like Willlis won't admit they are wrong when facts violate their own predjudices.Readers will notice that Zimmerman, Winner and Toman scurried away when their allegations were found to be false. For the benefit of readers - Philip Harrison and Steve Barber are presently preparing a response to Van Praag's work and I am in touch with them on a weekly basis.It appears Willis has a knack for putting his foot in his mouth. But people like him don't worry about that - they can just post anonymously and then run away. Interesting that Mel Ayton is now trying to act as a spokesman for the National Geographic Channel. It will be interesting to learn whether Ayton's claims concerning the alleged reasons why NGC did not include Van Praag's findings actually bear up. I suspect they will not. It won't take much to find out. I see that IMBd lists online the producers for this NGC program as Nicole Teusch and Tria Thalman. So let's ask them. Let's find out from Teusch and/or Thalman whether they wish to go on the record as stating that Ayton made representations to NGC to include in the program "challenges" by Van Praag. And let's find out if Teusch and/or Thalman wish to go on the record as stating that "their own experts" (whoever these people are, and I suspect they are mere figments of Ayton's imagination) simply did not find Van Praag’s findings worthy of any comment. I seriously doubt anyone at NGC reached such conclusions as Ayton claims! I suspect we will learn that Teusch Thalman know absolutely nothing about the above claims Ayton makes, simply because Ayton is making it all up. Ayton, a question for you. Why was Harrison unavailable for this NGC documentary? Is Harrison abandoning you? Has he decided now that he wants nothing more to do with you? Finally, Ayton apparently believes he can read people's minds. He states that I am awed by the news that Van Praag presented his paper to the AAFS and that I believe the institution has endorsed Van Praag’s work. Really Ayton? That's what I'm thinking, is it? You are able to mind meld with my thoughts, are you? Truly if you are such a man of supernatural powers then you are wasting your time lying about the RFK assassination... why not simply rule the world instead? Ayton, for your information, I made it crystal clear in my previous note that this Van Praag scientific paper was presented to the AAFS. That's all I said (that it was presented, and nothing more). And it's all I meant. I'm confident that my note on this was clear as a bell to most people (that is, except of course to you). Once again, Ayton, you show yourself to have no credibility. This article has certainly provoked the conspiracy buffs who have failed to provide any scientific challenge to the work of Philip Harrison, Peter French et al . Now we have yet another lay person who thinks he knows better - ‘Tom Willis’ – if that’s his real name. Willis tells HNN readers nothing about his background which might put him in a position to speak with any authority about the acoustics analysis of the Pruszynski Tape. It’s quite obvious he doesn’t have any. For the benefit of HNN readers representations were made to National Geographic to include the challenges to the work of acoustics experts Philip Harrison and Professor Peter French. National Geographic rejected this suggestion because their own experts simply did not find Van Praag’s ridiculous allegations that 13 shots had been fired in the pantry worthy of any comment. (eg Not one pantry earwitnesss claimed any silly recollection of this number of shots when they gave their statements to the LAPD and FBI.) They were the first to realize the difference between Van Praag – ( AUDIO ENGINEER) and Harrison and French (ACOUSTICS EXPERTS). As Harrrison was unavailable for the documentary Steve Barber became the spokesperson for the work of both the US and UK teams. ‘Willis’ and others are awed by the news that Van Praag presented his paper to the AAFS believing this institution endorsed Van Praag’s work. Well, Willis and your fellow conspiracy mongerers, THEY DID NOT. Nor will they until they manage to gather a team of American acoustics experts to look into his claims. In the meantime there has been only one team of professional ACOUSTICS EXPERTS who have fully examined the tape – Philip Harrison and Professor Peter French of JP French Associates and York University. * This fact has been lost on the US media and, naturally, the conspiracists. The acoustics experts who carried out the analysis of the Pruszynski tape for me are confident that a further examination of the tape by ACOUSTICS EXPERTS appointed by the AAFS will show no more than 8 shots were fired in the pantry of the Ambassador Hotel the night RFK was murdered by Sirhan Sirhan. Ayton really takes the cake. He gets his buddy Barber to appear immediately after him in a completely one-sided National Geographic Channel segment about the Pruszynski recording (which only mentions the conclusions of Ayton's hand-picked, half-informed audio analysts and mentions nothing about the differing conclusions of other audio analysts). No mention of Van Praag's Pruszynski scientific paper that was submitted to the American Academy of Forensic Sciences. Totally worthless, biased piece of garbage by National Geographic. Mel Ayton Apr-3 Mark As Violation"
Hey, at least ABC News showed onscreen Ayton's article, which is hell of a lot more than can be said for the entirely unfair, one-sided National Geographic Channel segment that Ayton and Barber were only to happy to try to dupe the American public with. By contrast, the NGC segment didn't even acknowledge the existence of any views on Pruszynski other than Barber's. "I hope you will take steps to publish the whole truth," Ayton bombasts to ABC. Well, Ayton, we hope you, Barber and National Geographic will take steps to broadcast the whole truth as well, and not merely show your side of this story only. But we won't hold our breath. I saw that National Geographic program. That Steve Barber segment was the most one-sided piece of garbage I've seen in a long time. In the meantime, I see that "Conspiracy Test" is going to be rebroadcast on Discovery Times channel, now known as Investigation Discovery channel. That will be at 1:00 PM on Friday, February 29 and again at 5:00 PM on Friday, March 7. Mr. Ayton, since I still have my calendar marked for March 10, I'm wondering: do you know at this point whether we should still expect to see this National Geographic Channel documentary premiering on that date? Also, are you aware that Philip Van Praag presented his Pruszynski recording results before the American Academy of Forensic Sciences last week? If so, would you wish to share with us your thoughts on this new development? I trust the National Geographic Channel has interviewed Mr. Van Praag for its documentary (elementary, I suppose). And so I look forward to this upcoming television program detailing Mr. Van Praag's AAFS results as well as presenting any opposing viewpoints. I hope you can provide us with an update on its premiere. For the benefit of HNN readers who have followed this debate please see the following descriptions of police interviews and excerpts from actual statements which prove that people who were in the pantry at the time of the shooting, other than the suspicous polka dot dress girl and her companions, left at the time the shots were firing or immedately afterwards. These witness statements confirm my earlier comments that people other than the mysterious polka dot girl left the pantry at the time of the shooting. Readers will recall that Thane Cesar also ran out of the pantry after the shots were fired and returned within a short space of time with fellow security guards, Jack Merrit and Albert Stowers, who were in the Embassy Room at the time of the shooting. Merrit must have observed the two men and the polka dot girl leave the pantry some time after the shooting ended. (Moldea, page 212). the press room in an attempt to notify our paper which was rapidly approaching a deadline. None of the phones that I tried in the press room would work so I ran into the main hallway and found David Druker, one of the two boys I had brought with me, still outside.I told him that Kennedy had been shot, to find Marc and lets get the film down to the Times. He came with me until I found a telephone, a pay booth behind some folding mirrors in the Cranston headquarters. I told him I would wait there until he brought marc dubin back. They appeared about two minutes later and we ran out the back entrance to the hotel—to where I had parked the car which was on Eighth St. right across from the driveway to the hotel's parking lot. As we were running out of the parking lot closest to the hotel a LAPD Sgt arrived with red lights on. I waved at him to stop and told him Senator Kennedy had been shot then continued my run to the car. I shouted at the parking lot attendent to keep the driveway open for an ambulance……. INTERVIEW WITH SUZANNE LOCKE : LOCKE noticed several men lying on the floor, one with blood on his forehead his eyes open and staring, but she did not recognize any of these individuals on the floor as Senator KENNEDY. Another individual in her immediate vicinity, a woman whom she did not know, had blood on her head and appeared to be stumbling backwards. She was attempting to get help from her friend ACQULINE but …. her thought was to attempt to reach the gunman who had done the shooting. Somehow, she got turned around as people were pushing in all directions and was heeded back toward the Embassy Room. Someone was apparently trying to close the double doors leading to the Embassy Room, but she was successful in getting out of the kitchen area end into a room behind the stage. She sat down and someone gave her a cigarette. That's right, Ayton. I have the audacity to keep on asking you for an answer to a question you have refused to answer directly and honestly (which is the very reason why you chose the weasel word "addressed"). You are "addressing" the question with a nonresponsive and dishonest answer. That's how you always address matters where you are weak on facts. When you cannot meet the demands of a particular issue, you stoop to playing cute games: you distort, bluster, redirect, etc. That's what all this page's postings consistently show about you. Still no evidence who Winner, Toman and Zimmerman are - readers can judge for themselves who is 'throwing in the towel'.Despite repeated requests asking 'them' to provide some background information 'they' have refused.And then 'Toman' has the audacity to keep on asking for answers to questions that have already been addressed.I believe most HNN readers who have followed this thread will agree. 'Toman' is hiding behind a cloak of anonymity so he can shirk off any responsiblity for his ludicrous conspiracy-mongering.It simply isn't good enough. It also has a cowardly stench to it. That's a very cute way of throwing in the towel, Ayton. But the fact remains: Clearly you are throwing in the towel. You are still failing to provide us with real proof that anyone other than suspicious persons ran out of the kitchen pantry at the time of the shooting. And, again, this was Zimmerman's very point: That there is no convincing evidence of anyone other than controversial figures in the case leaving the pantry at the crucial moment. You continue to misrepresent Zimmerman as saying "no one left the pantry." This is a straw man you keep propping up. But Zimmerman never said "no one left the pantry." He only questioned your claim that several people (in addition to suspicious figures) left the pantry. And when you tried to provide proof of your claim, he very effectively showed your "proof" to be no proof at all. Furthermore, by your only being able to list the girl in the polka dot dress, her male companion, Michael Wayne and Thane Eugene Cesar (all of which are controversial persons in this case) as leaving the pantry, you are again confirming Calder's and Zimmerman's point: that no one can provide convincing evidence of anyone other than these suspicious persons exiting the pantry at the crucial moment. Realizing you are obviously failing, you try to distract everyone from this failing of yours by taking one of Zimmerman's comments completely out of context in your last posting. In that Zimmerman comment you quoted, Zimmerman was referring specifically to film footage which you had falsely claimed showed people exiting the pantry at the crucial moment. He effectively pointed out why your claim about the footage was false and you eventually ended up conceding his point. But now you are stooping to mischaracterize his words there just as you attempted earlier to misrepresent him in the "no one" versus "several people" matter. And you are doing this for one reason: You are throwing in the towel and this is all you have left to offer. And so, you still cannot provide us with a single shred of convincing proof that anyone other than controversial, suspicious persons exited the pantry at the crucial moment (or you would have done so by now). All your bogus evidence was effectively shot down by Zimmerman and you have nothing further to offer but your tired efforts to distort HNN postings. Which is pathetic because anyone with an ounce of sense reading through all this page's posts should be able to see exactly what cute little games you're trying to play. Please, this time, try and concentrate your mind, will you? Provide us, finally at long last, some REAL proof (that is, convincing evidence which actually stands and doesn't easily collapse), that is free of your blustering and your re-direction, concerning the matter of Jack Merritt's statement that Calder raised in November. I am giving you an opportunity to retrieve your towel. Give us clear, convincing evidence of one single non-suspicious person (someone other than controversial figures like the girl, her companion, Wayne or Cesar) running out of the pantry at the crucial moment. Clear, convincing evidence, got it? And, yes, I do mean AT THE CRUCIAL MOMENT, Ayton. The answers I have provided to Winner, Calder and Zimmerman have fully addressed the issues raised, and I believe most HNN readers will agree. The initial point raised by Zimmerman and Calder was whether or not anyone else left the pantry besides the ‘suspicious’ girl in the polka dot dress and her male companion. I provided details of others who left the pantry, including Thane Cesar. Toman, Zimmerman and Calder refuse to accept this because it attacks their conspiracy-mongering. Toman writes, “Now you know full well that Zimmerman never stated in any of his posts that ‘no one left the pantry at (that) time.’ You're obviously attempting to sell us a red herring there.” Zimmerman wrote, “It's just that while I recall seeing many people leaving the ballroom in the state archives footage, I do not recall seeing several people leaving the specific area of the kitchen pantry immediately after the shooting (and my apologies in advance if this ends up being due to a simple oversight on my part).” Zimmerman then launches into an attempt to pour scorn on every example I give, including the statement of Thane Cesar who did indeed leave the pantry after shots had been fired to seek the assistance of Jack Merrit. If my other examples can be challenged this one certainly can’t which leaves the original premise that ‘no one left the pantry’ moot. Toman and Calder still refuse to give HNN readers some background information about themselves which is quite necessary in order for readers to gauge whether or not the points they raise are backed up by some expertize. Up to now they have not added anything to the discussions above except constant reiterations that they believe my statements about people leaving the pantry area are incorrect. Like all conspiracy buffs, they skewer the debate by harping on about minor points because they cannot answer or address the larger issues contained in my article. Like all conspiracy buffs they clearly have an agenda to prop up anything which smacks of conspiracy. I think it is high time HNN readers had some background knowledge of these purported ‘experts’. I’m guessing they will both, once again, refuse to give details about themselves as it will expose them as non-experts like this chap ( http://www.moldea.com/JHunt.html ) whose ludicrous RFK conspiracy theories are rejected by mainstream publishers. Ayton, all HNN readers have the right to publicly challenge, or put to the test, your assertions (I no less than anyone else). This just happens to be one of the most important features offered by the HNN web site, which I and other readers greatly appreciate. If your assertions have merit then they should withstand the healthy scrutiny. "As I pointed out to Zimmerman, he was wrong in stating no one left the pantry at the time of the shots or during the immediate aftermath." Now you know full well that Zimmerman never stated in any of his posts that "no one left the pantry at (that) time." You're obviously attempting to sell us a red herring there. Rather your exchange with Zimmerman was about whether or not "several" persons had left the pantry at that time; that is, several persons in addition to the suspicious girl in the polka dot dress and her male companion(s). This is not a trivial matter for it speaks to the very heart of a point Michael Calder made in his November posts concerning the account of security guard Jack Merritt. Initially, in your own November postings, you falsely claimed there was definitive evidence of several such people exiting the pantry in addition to the girl and her companion(s). But when Zimmerman chimed in and challenged you about your evidence (which concerned film footage and Michael Wayne), your claims collapsed like a house of cards. You then suddenly went silent and quickly exited your discussion with Zimmerman. And now, believing that Zimmerman may have lost interest and might not be coming back to challenge you any further, you are attempting to misrepresent how your exchange with him went and you are attempting to dismiss Zimmerman as having added nothing to the debate, when in fact you know full well the very opposite of that is true. Zimmerman made some outstanding points that contribute a great deal and deal an effective blow to you. Luckily for HNN readers, they don't have to rely on you for the blow-by-blow but can read all those November posts on this very page, seeing for themselves how your discussions with Calder and Zimmerman really went. As HNN readers will see when they read through the Calder-Zimmerman exchanges with you, your recitation of part of your November 22 reply to Zimmerman does nothing to help you. For one thing, you conceded in that very post that it is nothing more than "interpretation" to believe that the stocky man and a woman (undescribed), seen in the footage, had actually exited the pantry. You went on to concede the difficulty in ascertaining a person's pathway from the footage. For another thing, it was very telling that in your November 22 post you tried to play cute by stating that another woman (a lady in a beehive hairstyle, wearing glasses) is seen in the footage struggling to exit the pantry "area" - your fudge word "area" was your clumsy effort to give the false impression to HNN readers that you had found someone exiting the pantry itself (hoping no one would notice your little sleight of hand in using the phrase "pantry area"). The reason you very carefully used the term "pantry area" was to try to include the area outside the pantry, just in case the beehive-haired woman was not really exiting the actual pantry but might have come from another location. So which is it, Ayton? Is the beehive-haired lady definitely exiting the actual pantry itself or is she - like the stocky man and the other woman you mention - merely a person whose origin and pathway cannot really be ascertained from the footage? This time, please answer. Zimmerman had challenged you to prove that the beehive-haired woman was exiting the actual pantry. But that turned out to be exactly the point where you suddenly went silent and fled your discussion with him (only to slither back weeks later to try to give a false account of that discussion). Of course, you and I both know the answer to Zimmerman's question about the beehive-haired lady, don't we Ayton? The answer is that you cannot really ascertain from the footage whether or not the beehive-haired woman is actually exiting the actual pantry itself (and please, in your next reply, do refrain from insulting our intelligence by trying to use fudge terms like "pantry area" because this subject matter concerns the precise location known as the kitchen pantry and not some general "pantry area" that easily would be subject to misinterpretations). "I've now checked out a copy of Kaiser's book, 'RFK Must Die'. Unfortunately, it is impossible to determine from Kaiser's narrative whether the persons tackling Michael Wayne came from the pantry as did Wayne. As you know, they could have been outside the pantry and tackled Wayne after hearing others yelling about him. Respectfully I must say that to conclude the tacklers also had been inside the pantry and had rushed out of it as the shooting was still in progress appears to me to be a leap of faith. "Therefore, while most people are entering the pantry, we can definitely say that we have one suspicious (and as you indicate, controversial) person named Michael Wayne, running from the pantry. Which supports the very point Mr. Calder was making earlier. "I don't believe we will need to go into the Kaiser passages concerning young Daniel Curtin, since you already agree that these passages do not reveal persons running out of the pantry during or immediately following the RFK shooting (in having read pages 35-36, I would agree with that and, once again, Mr. Calder's point is not being successfully challenged). "And so it would appear that you have yet to clearly show specific examples of non-suspicious, non-controversial persons running out of the pantry while the shooting was in progress." A sure sign that you are beaten will be your continued efforts to try to downplay this discussion that's grown out of Calder's comments concerning the Jack Merritt statement; as well as your continued efforts to try to silence your critics by questioning whether such readers even have the right to engage in this HNN Comments section. All HNN readers have this right. Provide for us, finally at long last, some REAL proof (that is, convincing evidence which actually stands and doesn't easily collapse), that is free of your blustering and your re-direction, concerning the matter of Jack Merritt's statement that Calder raised in November. If you can convincingly defeat Calder on this Merritt matter, then do so. You either can or you cannot. So far, you have not done so. Please set your focus on that important matter (stop taking detours) and please, this time, do so convincingly. Frank D Toman (or possibly Winner in disguise) apparently believes that bluster and re-direction will win the day. Readers should re-read the exchange with Zimmerman to understand how he and others have desperately tried to nitpick and skewer the debate into anything but the subject matter of the article. I have now ascertained it is a clip of film footage found on the History Channel documentary ‘The RFK Assassination’ and it clearly shows a woman in a ‘beehive’ hairstyle, wearing glasses, struggling to exit the pantry area in the direction of the Embassy Ballroom - this occurs approximately 7 minutes into the History Channel documentary, ‘The RFK Assassination’(Executive Producer Jonathan Towers, Towers Productions, I’m afraid my copy doesn’t bear any date but I believe it is the 2005 production). I tried to find this clip on the CSA footage but without success. As you are aware, other researchers have resurrected film footage that cannot be found in the CSA archives. In the CSA footage which you make reference to (14.06) there appears to be a man in his mid to late 30s, stocky and wearing glasses, who exits the pantry door. However, I accept this is a matter of interpretation. He may have been stationed at the door then walked away from the pantry area doors. At 14.08 there also appears to be a woman exiting the pantry area doors but, again, the origins of her pathway aren’t clear. The statement made by newsman Steve Arvin also indicates that people who were in the pantry at or around the exact time of the shooting had left the area shortly afterwards. Arvin was at a bank of telephones at the west end of the Embassy Room and put eyewitness Danny Curtin on the air ‘minutes later’. Curtin had been outside the pantry doors, heard shots , entered, and then saw RFK wounded. Curtin spoke to RFK and gave him rosary beads but then immediately exited the pantry. (Kaiser, page 36) Of course, this doesn’t indicate that people left the pantry immediately the shots were fired but Merrit doesn’t say that either. Thane Cesar also ran out of the pantry after the shots were fired and returned minutes later (Moldea, page 212). Cesar had left to summon other Ace guards to the pantry including Jack Merrit and Albert Stowers who were in the Embassy Room at the time of the shooting. So you see, Merrit must have observed the two men and the girl leave the pantry some minutes after the shooting. Toman arrogantly gives his opinion that I know nothing about this case -I'm sure readers will recognize the silliness and immaturity of his remarks. Leading RFK assassination expert Dan Moldea believes differently and for me that's much better than an opinion from an anonymous conspiracy-mongerer. Perhaps Toman, Zimmerman and Winner (if they are not the same person)can inform HNN readers of their published works about this case. I'd be interested to know whether any respectable publisher or magazine editor has taken their conspiracy ruminations seriously. Also, just to correct Mr. Kent: Unless mistaken, I believe the total number of shots fired from behind Robert Kennedy was four, not three. It's been my understanding that Kennedy was wounded three times from behind and that a fourth bullet also fired from the rear passed through his clothing. If I have any of that wrong, then please set me straight. Thanks. Would someone please update us with more information about this "second handgun" (which I assume would be Thane Eugene Cesar's firearm)? What is the current status of these efforts to conduct DOJ tests on this weapon? And who is spearheading these efforts and for what purpose? Ayton, some weeks ago, you very rudely called me a "typical blowhard." Well this Typical Blowhard would like to point out that you are a blowhard when it comes to Randy Zimmerman's earlier comments. Despite your attempt to misrepresent Zimmerman, anyone reading his earlier posts on this page can see for oneself Zimmerman never stated that "no one" left the pantry at the time of the shots or during the immediate aftermath; rather, the key phrase in your debate with him was "several people" and you know it. As his exchange with you in the earlier posts clearly shows, all Zimmerman did was challenge your lies claiming that film and eyewitness statements proved "several people" had rushed out of the pantry during or immediately after the shooting. You never once pointed out anything that effectively countered Zimmerman's challenge. And you still have yet to present convincing evidence of "several people" running out. Instead, you were the one who dropped the ball in that discussion by running away from it, not Zimmerman. Thus, his points still stand. If you are going to present us with convincing evidence about "several people" leaving the pantry, than do so. But please don't stoop to misrepresenting someone else's posts. I would recommend that everyone read over Zimmerman's comments and your replies to him, to see for themselves how that exchange really went and not rely on your false account of it. Contary to your assertion, Zimmerman actually added a great deal to this debate by exposing your hollow words about a subject you obviously don't understand. Typical of conspiracy-mongerers Winner teases out some small part of this article whilst ignoring the overall thesis which renders Van Praag’s analysis void. Winner’s remarks are indeed revelatory but only in the sense he cannot provide any real argument about Harrison and Barber’s findings with regard to Van Praag’s unpublished research. I suggest he re-read the article to understand what the acoustics experts are saying with regard to the time span of the recordings and the reaction of the crowd in the vicinity of the pantry and Embassy Ballroom. As far as the reaction of the crowd is concerned Harrison’s remarks are indeed pertinent when the reader views the film footage which captures the area near the stage and the eventual reaction from people who had been near the door leading to the pantry. As I pointed out to Zimmerman, he was wrong in stating no one left the pantry at the time of the shots or during the immediate aftermath. Zimmerman has added nothing to the debate. How Winner, if that is his real name, can arrogantly make judgments about these recordings when he has no qualifications whatsoever is indeed risible. (If Winner did indeed have the requisite qualifications he would have made reference to them) As it stands HNN readers are being asked to accept the ruminations of someone who presents himself as an expert when we know nothing about him at all or even if ‘Mike Winner’ is his real name. I challenge Winner to provide details about his acoustics expertize so HNN readers can verify them with a simple google search. "There are over 8 seconds of material after the thump before there is a break in the recording. During those 8 seconds there are no indications of panic within the ballroom crowd and no shot sounds can be heard. There is a further short recording with a duration of 6 seconds and again there are no obvious signs of panic in the crowd. It isn’t until the next recording, some 14 seconds after the thump (not including time elapsed whilst the camera was not recording) that signs of panic start to become apparent. If Van Praag’s timings are correct then why did it take so long for the crowd to react?" Ayton apparently knows next to nothing about the Ambassador Hotel's Embassy Room and kitchen layout. I think that's made particularly clear by the exchange he had with Randy Zimmerman. Anyone familiar with the hotel layout should understand immediately that most people in the Embassy Room probably were not able to see or hear the Bobby Kennedy shooting as it was taking place in the kitchen pantry. While, by all accounts, the people inside the kitchen pantry itself (where the shots were fired) certainly were well aware of the shooting immediately, it obviously would have been an entirely different situation for people inside the Embassy Room. There was a corridor separating that ballroom from the kitchen pantry, and the hotel layout clearly shows that largely because of that separating corridor people inside the ballroom, even those nearest to the corridor leading to the kitchen pantry, could not have seen very far into the pantry from the ballroom. This is a fact which Ayton either is blissfully ignorant of or simply chooses to ignore (see his exchanges with Randy Zimmerman). That alone is an astonishing fact for Ayton to miss. Knowing the murder scene is essential and Ayton doesn't seem to know it very well at all. How Ayton can arrogantly carry himself off as any kind of seriously well-informed or objective expert on the RFK assassination is beyond me. In addition to what they could and could not see from the Embassy Room, people inside that crowded ballroom obviously had to contend with many different sounds that were normal to this particular busy environment. There is that and there is also the matter of distance. We cannot be sure that the cameraman inside the Embassy Room who shot this ballroom film, or his sound man who would have held the camera's microphone, would have been able to pick up the sound of the pantry's .22-caliber shots from their ballroom location, even though Ayton prefers to assume that the camera crew should have been able to pick up any shot sounds coming from the kitchen area at that particular moment and in that loud environment. So contrary to what Ayton would try to have you believe, simply because it suits his aims, we should not assume that the Embassy Room crowd's reaction to the kitchen pantry shooting itself or even to its aftermath would have had to be immediate. Nor should we assume that the camera crew that shot this particular film inside the Embassy Room would have had to pick up the kitchen pantry shots from the crew's location in the ballroom. Ayton has failed to prove that Van Praag's timings are inaccurate. Anyone else know of Disney's long-standing role as USG psy-ops for kids? The Pentagon took over Disney during WWII to make training and propaganda films. Afterwards, the relationship continued covertly and Disney used Nazi Project Paperclip scientists like Heinz Haber to indoctrinate US kids into loving atomic power with the 'Our Friend the Atom' school science textbook and films. Disney also makes counter-propaganda to protect authority in the minds of children by fictionalizing scandal and doing subliminal negative framing of whistleblowers and anti-war symbols. Like putting out 'The Shaggy D.A.' in 1976 when the investigation that New Orleans D.A. Jim Garrison made into the murder of JFK was about to be covered again by the House Select Committee on Assassinations from 1977-1979, the same time CIA-CBS inundated us with TV's 'Dallas' and "who shot JR."
rat in the kitchen, secret control of other people, etc. This psy-ops technique is meant to pre-bias young brains against narratives hostile to power that they might overhear from adults by using semantic dismemberment of the story. Semantic dismemberment is using main components of a narrative grafted onto similar but much more benign narratives to confuse the brain if it should ever run across the original narrative TPTB want hidden from kids lest they come to distrust authority. There is a neurological basis for 'strong first impressions' and this is exploited by turning scandals into fictional entertainment for youth. Thought this board might be interested in this topic. Because this is partly how these crimes are gotten away with, co-opting them into amusement to de-sensitize us with pre-conditioning of dangerous words and stories. Shane O'Sullivan of Great Britain has a new dvd on the RFK Assassination that has just been released, It is available on Amazon.com and more info is at rfkmustdie.com He interviewed Sandra Serrano giving her first interview in 40 years. Should be fascinating. Also, in the film you have from the California State Archives, pause or put in slow motion as the camera in the pantry scans the pantry and you will see Valerie Schulte standing next to a gentleman. How beautiful she is. But she is also non plussed about what just happened in front of her. A Senator has just been shot next her and she looks like a bored homecoming queen at the schoool dance. Interesting. If I was the suspicious type I might think she was prepared for the shooting and maybe a pre selected "witness" to the murder of another Kennedy. Since Evan Freed standing close to Valerie saw a second gunman fire at RFK, this means that the other people around Kennedy also saw a second gunman. Could Richard Helms be so brilliant as to supply his own witnesses this time around. I wonder. Vince Di Pierro: "She was goodlooking so I looked at her. She was standing behind the tray stand because she was up next to him on - behind, and she was holding on to the other end of the tray table and she -like -it looked as if she was almost holding him. Very shapely, brunette, shoulder lenth hair, bively collar." Serrano: "White dress, caucasian, dark brown hair, 5'6", black polka dots on dress,she had a funny nose, she had a good figure. She was wearing a white voile dress with black polka dots and a bib collar. Black shoes, A-frame, a bouffant job,(hair) 3/4 lenth sleeves. She practically stepped on me and she said, "We've shot him. We've shot him." Then I said, "Who did you shoot?" And she said, "We shot Kennedy." LAPD: Was there anybody around you that heard this statement? Serrano: "Yeah, there was some people just, you know, standing there and then, you know, I just got up and walked away...."
Katherine Keir: Miss Keir watched the activities in the Sunset Room for some time and then walked out of the room and on to the platform of the adjoining stairway. While standing on a platform she saw a young female, caucasian, dressed in a polka dot dress, black and white, run from the Sunset Room and down the stairway. The young female was yelling, "We shot Kennedy." When someone gives a statement and it is taped and later transcribed, there is no taking it back. Especially if it is the first interview when no one is putting pressure on the witness, when the investigators are merely asking questions in order to ascertain what happened, when everything is fresh in the witness's memory, these are the most trustworthy of all statements. A pattern emerged that is easily identifiable in regards to statements that were truthful but indicated conspiracy. Each witness was brought to LAPD polygraph operator Hernandez for "the treatment." He would tell them they failed the polygraph and therefore are lying and ask if they want this to become public knowledge. He would bully and browbeat them and always suggest an alternate version for them to agree with. During the investigation he was promoted to Lieutenant. Gee, I wonder why. He was more successful with teenagers and young, (under 25) adults but those over the age of forty, when he tried to intimidate and get them to change their stories, they usually told him in effect, to go to hell. Poor Sandy Serrano. She tried valiantly to hold out to the truth. Hernandez was relentless. In the last interview trying to break her he even yells at her, "This never happened." Is that how interviews are suppose to be conducted. Sandy will have her revenge against this CIA traitor, Hernandez , in the revised edition of JFK VS. CIA in the spring of 2008. As I have neither of these, I'm proceeding to order copies of both. Thanks for making the mention and naturally I'd be grateful for any other documentaries you might care to recommend (including information as to the production company and so on, if you wouldn't mind). Two things: First, our beehive woman is in the vestibule (the same area where Pat Paulsen was located when, in that earlier C.S.A. film, Paulsen suddenly turned around and headed into the pantry to visit with Milton Berle). The vestibule lies between the pantry, the ballroom and the long narrow corridor to which I referred earlier and my footage does not indicate from which of these areas she accessed the vestibule (do you feel your footage, which hopefully I myself will have within a few days, clearly shows this beehive woman accessing the vestibule from the pantry?). Next, my footage of the beehive woman does not make clear when exactly we are seeing her, so I cannot tell from this if the shooting is still under way in the unseen pantry at the moment she is seen in the vestibule (do you feel your footage clarifies that matter?). So, at this point at least, I would not be willing to accept that this beehive woman is coming out of the pantry nor would I be willing to accept that the pantry shooting is still under way at the moment we see her in this footage. I look forward to viewing your own footage of this beehive woman in "Conspiracy?" and/or "Investigative Reports." 2. Concerning the C.S.A. footage where you reference another woman as well as "a man in his mid to late 30s, stocky and wearing glasses", I'm glad to see you now concur with me that we really cannot determine the actual origins or pathways of such persons as these (given, for one thing, that in such footage we really are not seeing the pantry double doors themselves but are only seeing the ballroom service doors that access the vestibule). And I suspect the same is likely to prove true of the beehive woman but I'll wait for the two documentaries. 3. From my local library, I've now checked out a copy of Kaiser's book, "RFK Must Die". Unfortunately, it is impossible to determine from Kaiser's narrative whether the persons tackling Michael Wayne came from the pantry as did Wayne. As you know, they could have been outside the pantry and tackled Wayne after hearing others yelling about him. Respectfully I must say that to conclude the tacklers also had been inside the pantry and had rushed out of it as the shooting was still in progress appears to me to be a leap of faith. Therefore, while most people are entering the pantry, we can definitely say that we have one suspicious (and as you indicate, controversial) person named Michael Wayne, running from the pantry. Which supports the very point Mr. Calder was making earlier. 4. I don't believe we will need to go into the Kaiser passages concerning young Daniel Curtin, since you already agree that these passages do not reveal persons running out of the pantry during or immediately following the RFK shooting (in having read pages 35-36, I would agree with that and, once again, Mr. Calder's point is not being successfully challenged). And so it would appear that you have yet to clearly show specific examples of non-suspicious, non-controversial persons running out of the pantry while the shooting was in progress. Assuming we can now agree that we really have nothing solid concerning such alleged persons, I would think we can agree to dispose of all that and switch our focus to the Jack Merritt statement(s). If you would, please allow me some time to familiarize myself with the Merritt comments which, according to Mr. Calder, reveal that people were running into -- not out of -- the pantry with the only exceptions of the suspicious persons Merritt observed. And I'm sure you would agree with me, Mr. Ayton, that it would not be fair to HNN readers for the two of us to conduct these discussions by private email. After all, there is an issue of accountability, which these public forums provide but which private emails do not. My best wishes to you. I was working from memory when I indicated to you that various individuals had exited as well as entered the pantry area at the time of the shooting. I had been making reference to another documentary which included scenes I had not identified on the CSA film. I have now ascertained it is a clip of film footage found on the History Channel documentary ‘The RFK Assassination’ and it clearly shows a woman in a ‘beehive’ hairstyle, wearing glasses, struggling to exit the pantry area in the direction of the Embassy Ballroom - this occurs approximately 7 minutes into the History Channel documentary, ‘The RFK Assassination’(Executive Producer Jonathan Towers, Towers Productions, I’m afraid my copy doesn’t bear any date but I believe it is the 2005 production). I tried to find this clip on the CSA footage but without success. As you are aware, other researchers have resurrected film footage that cannot be found in the CSA archives. I hope you’ll appreciate that I have given a great deal of my time in answering readers’ questions and discussing issues. Curiously, none of the posters have made reference to the acoustics evidence which was the subject of my article but instead have used this forum as a way to bring up controversial issues about the assassination. This is the reason I have referred some posters to my previous HNN, FrontPage Magazine and Crime Magazine articles. However, as you will appreciate, I cannot spend limitless amounts of time which takes away from the research about another subject I am involved with at the present time. If you wish to correspond with me about this case I would be more than delighted and can fit the time in at my leisure. You can email HNN’s editor who will, I’m sure, pass your emails on to me. Unlike some posters, you have shown you can debate an issue in a civil manner and I appreciate that. Mr. Ayton, I'm sure you would agree with me that should it turn out that these purported witness accounts of several people running from the kitchen pantry are not really as solid as you believe them to be, then it would be all the more important for us to see film footage or photographs which would clearly show all these people exiting the pantry during or immediately after the shooting. So I would like very much to see such footage, if in fact it really exists, and I would think that you would be just as interested in that. I hope that you will please let me know when you have located such film, assuming it actually exists. In the meantime, would you please be so kind as to specifically reference for us this Michael Wayne testimony (as well as that of any other witness) which would state clearly that there were several people running out of the pantry during or shortly after the RFK shooting? After all, Mr. Calder raised a very interesting point earlier when he posted the following: "What caught (ACE security guard) Jack Merrit's attention was everyone was trying to get into the pantry to see what happened yet these (suspicious) individuals were leaving the pantry." Respectfully, I must say that you have not successfully countered Mr. Calder's point. Obviously, more is needed here than your general references to Michael Wayne, other unidentified witnesses and unidentified footage. There must be a Wayne/witnesses transcript or a recording from which you could quote. Isn't there? You have certainly done your homework and I commend you for that.As you are aware, there is a great deal of news footage and not all is available on the CSA DVD -some documentary makers, for example have news footage which cannot be found on the CSA DVD (eg I captured a still of a Sirhan lookalike - see my polka dot girl article - from film footage used by a documentary maker and tried unsuccessfully to find it on the CSA DVD.Nonetheless, I am quite certain, without spending yet more endless amounts of time going through my archived film, that witnesses entering and leaving the pantry area have been filmed. Having said that, the issue is somewhat moot if reference is made to the many accounts of witnesses - eg Michael Wayne, etc - who said people did indeed leave the pantry when the shots were fired. Mr. Ayton, thank you for your response. With all due respect though, I believe you are mistaken concerning what the "Campbell" scene shows. This clearly is ballroom footage only and does not show anyone emerging directly from the kitchen pantry. If you'll be so kind as to endulge me, I would like to show you how I have reached this conclusion. I have this "Campbell" scene to which you are referring. I myself don't know whether the film of this scene was originally shot by CBS but if your research indicates that, then I would have no reason to doubt it. I have the "Campbell" scene by way of two sources. First, this scene is shown in video of Mr. O'Sullivan's BBC appearance from one year ago (and by the way, that reminds me that I must remember to place an online order for his new "RFK Must Die" documentary). Secondly, this same "Campbell" scene is indeed featured in the Calif. State Archives footage that I have on dvd. When you get a chance, I wish you would re-examine this "Campbell" scene. When time permits you to do this, please go to the first of the Calif. State Archives films, which the C.S.A. identifies as "Special Unit Senator Composite film: Senator Kennedy Assassination June 5, 1968". Zero your dvd or tape counter at the point when the moving images of this composite footage actually begin. Then fast-forward exactly 14 minutes and you will see this "Campbell" ballroom scene that you have referenced (the "Campbell" scene begins with an unidentified young man pointing his finger to his head while repeatedly mouthing the word, "bang", and this is followed immediately by the film camera panning over to where "Campbell" and another man with a mustache are seen, the exact scene Mr. O'Sullivan has also referenced). If you'll look over this "Campbell" ballroom scene again, I believe that this time it will be clear to you that it, at no time, shows anyone emerging directly from the kitchen pantry. For the simple reason that the entrance/exit to the pantry cannot be seen in this "Campbell" ballroom footage (the pantry entrance/exit is entirely out of camera range, which I will demonstrate in a moment). My point here is that while this "Campbell" footage certainly shows people moving about in the ballroom, there is no way to confirm from this footage that any of them are emerging directly from the actual pantry entrance/exit, which is completely unseen in the "Campbell" footage. To demonstrate my point about the pantry entrance/exit not being pictured in this "Campbell" ballroom scene, I would also direct you to the C.S.A. 's second film which, on my dvd, directly follows the C.S.A. 's composite film at roughly the 23-minute mark. This second film is identified as "Pat Paulsen - Prior to Kennedy speech Ambassador Hotel June 4, 1968 Produced by Group One Prod. (Silent)". The Paulsen footage shows the late television comedian Pat Paulsen at the Ambassador Hotel on the night of the RFK shooting and it is obvious from its scenes that this Paulsen film indeed was shot sometime that night just prior to the assassination. At the 29-minute mark in my dvd, you see Paulsen walking down a narrow, crowded corridor after he's just been filmed speaking with Pierre Salinger. You can see that Paulsen is walking towards the kitchen pantry entrance/exit but when he nears it, he doesn't enter the pantry right away. Before he can get to the pantry entrance/exit, Paulsen turns right and moves toward a couple of service doors which directly access the ballroom (these are the same two service doors that we also see in the "Campbell" ballroom scene, but from the other side of those service doors in the "Campbell" footage). Paulsen does not enter either of these two ballroom service doors but instead turns completely around and heads into the kitchen pantry by way of the pantry's entrance-exit, the same which was seen only a moment before in the footage (Paulsen enters the pantry via an open doorway, which is the left half of two double swinging doors). Once inside the kitchen pantry, Paulsen is next seen talking and joking with comedian Milton Berle. When you compare this Paulsen film footage with the "Campbell" film footage, it is abundantly clear that the "Campbell" scene does not show the pantry entrance/exit, through which Pat Paulsen had earlier that evening passed to enter the kitchen pantry. It's clear the "Campbell" film shows no pantry doors whatsoever. The "Campbell" ballroom film shows ballroom service doors, certainly. But as the Paulsen film makes clear, neither of these service doors access directly into the pantry. Rather, the service doors access the previously-mentioned narrow corridor. Once inside that corridor, one can then access the kitchen pantry by way of the pantry's entrance/exit (i.e. the double swinging pantry doors) but one can also head away from the pantry, down the narrow corridor. This is no small matter. Clearly, this means that the "Campbell" scene, which was shot from inside the ballroom, is showing people entering the ballroom by way of the ballroom service doors, but we cannot be certain from as to where these people are coming from (whether they are coming directly from the kitchen pantry or coming from the narrow corridor instead). So, as I say, Mr. Ayton, I believe you are very clearly mistaken when you say that the "Campbell" scene shows people "entering the pantry and others can be seen leaving the pantry." You would have to be able to actually see the pantry entrance/exit to know that. But at this point I certainly have no reason to doubt your claim that you have seen some footage somewhere that shows several people emerging from the kitchen pantry during or immediately following the RFK pantry shooting. Since we can, in that regard, rule the "Campbell" footage out, I hope that you will be so kind as to go through your materials, located this particular footage and identify it, as I would very much like to see it. Thank you sir. Try the scene which Shane O'Sullivan uses which purportedly shows 'CIA agent, Gordon Campbell' being allegedly directed by another purported agent from the pantry to the other side of the Embassy Ballroom shortly after people react to the shots.You'll find it on the CBS section of the CSA dvd, if I'm not mistaken (I'm doing this from memory - as you well know, many hours can be taken up searching the footage).People can be seen entering the pantry and others can be seen leaving the pantry. You fail to tell HNN readers that Evan Freed retracted his story - as did so many witnesses who, in the heat of the moment, thought they saw particularly 'odd' events when later they were able to formulate a much better picture of what exactly they did see. You must know this if you have read the LAPD 1500 page Summary Report. Marcus McBroom and Donald Schulman both made similar statements about possible 'second gunmen' but they later retracted them. McBroom, nearly 20 years after the assassination, descibed someone who ran out of the pantry with a rolled up newspaper with a gun hidden inside it - in all likelihood this person was Michael Wayne - who had a rolled up poster of RFK and fled the pantry when the shooting started.Strangely enough, someone did shout 'Stop that guy' and Wayne was apprehended and questioned by police. However, no one I know seriously thinks that Wayne had anything to do with the assassination. In my book I make reference to the psychology of eyewitness sightings.I suggest you read my book before you reference any further discrepencies in eyewitness testimony. As happens in ALL murder cases and bank robberies when 'witnesses' see the crime taking place, ten witnesses means ten different versions. I think the majority of HNN readers will have figured out what you are trying to do. In the manner of all conspiracists you simply posit anomalies in the case which have already been addressed and rational answers presented.Every conspiracy book I have read is structured in this way - this looks suspicious, that looks suspicious - but not one iota of credible evidence to support their theorizing is given.And, like you, they omit telling their readers important parts of the story. Hello Mr. Ayton, how do you do? Your HNN article is interesting. Thank you for putting it out. First of all, I'm nobody special (I would never claim to be an expert on anything!) but I am quite fascinated by this case. And I'm interested in reading and hearing the various arguments given by all sides. Some time ago, I purchased from a collector a dvd of the Calif. State Archives films you mention. It looks to me like the Internet has facilitated in making this footage widely available to the public. If this would not be too inconvenient, would you be so kind as to pinpoint where exactly in the state archives footage you are seeing "people leaving the pantry shortly after the shots were fired"? Please know that I am not doubting you. It's just that while I recall seeing many people leaving the ballroom in the state archives footage, I do not recall seeing several people leaving the specific area of the kitchen pantry immediately after the shooting (and my apologies in advance if this ends up being due to a simple oversight on my part). Anyway, sir, if you have the time to do this and you don't mind doing it, I would be grateful if you would direct me to this particular scene in the Calif. state archives footage. Thank you and best wishes. There is a second gunman but it's not Thane Cesar. I have a copy of the Evan Freed four page affidavit. In 1992 when Evan freed wrote and signed the affidavit he was a lawyer working for the city of Los Angeles. In 1968 he was a full time college student and part time phtotgrapher working for the Copley News Service assigned to cover the RFK campaign. The entire affidavit will be in the revised edition of JFK VS.CIA to be published in the spring of 2008 but allow me to submit a few relevant paragraphs. "I immediately went into the Embassy Room pantry area arriving there about 5 minutes prior to the end of the Senator's speech. Two men who looked very similar in appearance and clothing were moving about the pantry area. One man was wearing lighter clothing than the other, and he was holding a drink glass in his hand. The second man was standing near the south wall of the pantry, directly across from a large metal serving table. The men never stood together, however, they appeared to be looking at each other from time-to-time. I did not pay particular attention to the 2nd man, although I do recall thinking that he was the other man's brother. I assumed that they were in the pantry to avoid the large crowd in the Embassy Room. The man with the drink was Sirhan Sirhan. I was facing the Senator's right side at that time, about 4 feet away. It was at this time that shooting began. I saw the second man(wearing the darker clothing) who had been in the pantry with Sirhan during the speech pointing a gun in an upward angle at the Senator. Based on the sound I heard, I believe the first shot came from this man's gun. In the background and about 6-8 feet from me, I could see Sirhan firing a revolver held in his right hand in the direction of the Senator. People in the crowd were screaming and grabbing Sirhan and I remeber they were holding his arm as he was shooting. I cannot say how many shots were fired by Sirhan or by the second gunman. As the crowd rushed towards Sirhan, they passed by the 2nd gunman. He was backing away, towards the east end of the pantry. I was shoved by the surge of the crowd back against the south wall of the pantry where I was alone next to another door that exited into the Embassy Room. At that time I observed the 2nd gunman running in my direction. He was not holding a gun at that time. Another man was running behind him in the same direction yelling to me, "Stop that guy, stop him." There was no one else that he could have been yelling at. This took place just as I was opening the door to the Embassy Room to get some help. As the second gunman came to the door, the man pursing him yelled to me again, "Get him, get it." As the 2nd gunman passed through the door, the man pursuing him tried to grab him but failed. Both men ran into the Embassy Room. My question is how many other witnesses next to Kennedy also saw and reported a second gunman and not have this mentioned in the LAPD and FBI reports. You will also, I'm sure, find the coming National Geographic Channel documentary about the CIA fascinating - part of the program deals with the RFK case including a look at the acoustics evidence. However, the date for broadcast has now been changed to 10th March 2008. You are stating that the girl in the polka dot dress who was observed in the pantry was the girl seen by Sandra Serrano. Please read the following article then provide proof that your statement is correct. Furthermore, you imply that these individuals were the only people trying to escape the pantry. Have you read anything about Michael Wayne? Have you, indeed, viewed the California State Archives film footage of people leaving the pantry shortly after the shots were fired? Obviously not. You are impressed with the physical evidence in the case yet you offer nothing to challenge the conclusions of my acoustics experts. It would have been more enlightening for HNN readers if you stated an expert opinion on why the Discovery Channel was correct. As it stands,you offer nothing more than the typical blowhard reaction and hollow words about a subject you obviously don't understand. What caught Jack Merrit's attention was everyone was trying to get into the pantry to see what happened yet these individuls were leaving the pantry. The girl in the polka dot dress would be seen escaping with one of her male companions down the outside fire escape by Sandra Serrano. As expected, as soon as an article about this case appears the conspiracy mongerers respond with speculation and rumor without providing the reader with any background information or, indeed credible evidence. It is quite obvious the naysayers, so far, have not researched this case too well. One critic, above, has made a definitive statement about a ‘second gun’ which inevitably leads readers to believe the gun he mentions is the one that killed RFK. No, it isn’t and there isn’t any proof whatsover to support this allegation. I challenge him to provide the evidence. I support the efforts of state DOJ investigators to examine this gun. However, readers need to know something about the background to this weapon and the background to the man who the reader alleges shot RFK. At 11:15 p.m. he was assigned to check credentials at the Colonial Room doorway and clear the way for the Kennedy entourage en route. As the crowd entered through the kitchen pantry food service area, he took up his duty and followed Senator Kennedy closely behind and to the right. Seconds later, when the shooting began, Cesar hit the floor and drew his weapon only as he began to get up. He insisted he did not fire it. Cesar was interviewed during a reinvestigation of the assassination by the Los Angeles Special Counsel Thomas Kranz in the mid-1970s. He told investigators that he could have left the Ambassador without talking to anyone about the incident as no one seemed to be interested in taking his statement. He told LAPD officers that he had been inside the pantry at the time of the shooting, and they took him to Ramparts Police Station, where he was questioned. However, officers failed to examine his .38 pistol. Cesar also told the Kranz team that Ted Charach, who had filmed him for a documentary, 'The Second Gun', had taken his statements out of context and exaggerated them. Conspiracy advocates alleged that the only armed man witnesses saw close enough to Kennedy to fire and cause powder burns was Cesar. Did Cesar shoot RFK point blank behind the ear while they were both standing, then fall to the floor and fire three more times? However, Moldea found no evidence that Cesar had worked for the Mafia, the CIA, billionaire Howard Hughes, and he had not worked as freelance hit-man or been a member of a right-wing political organization—as conspiracy advocates alleged. Accusing Cesar of being the second gunman seems ridiculous at the outset. He would have had to put his gun very close to Kennedy’s head at the same time Sirhan was firing rapidly in his direction, and he would have ran a considerable risk of being shot. The Cesar-as-second-gunman theory is thus rendered highly improbable. There is also another ridiculous component to the conspiracy advocates’ attempts to link Cesar to the shooting – why would a murderer, under threat of execution if caught, hang on to the purported murder weapon for 3 months before he got rid of it? Cesar sold the weapon in September 1968 – think about it – he sold it instead of throwing it in a river! In my book ‘The Forgotten Terrorist’ I deal at great length with the issue of a possible ‘second gun’. With very little effort at all conspiracists believe they can posit the notion of a ‘second gun’ and fool HNN readers.All they can supply, however, is guesswork, speculation and the statements made by some eyewitnesses, most of whom changed their stories - not out of pressure from the authorities but after careful consideration of what they had observed. One such witness ,of course, was DiPierro, another, Jack Merrit. Merrit did indeed tell FBI agents he had observed two men and a woman in a polka dot dress leave the pantry when the shooting started – but so did many others – they were naturally escaping from a dangerous situation that ensued when Sirhan started firing. As to the comment made previously that “ Everyone also recognized that Dan Moldea and others have made a living off the idea that Sirhan Sirhan acted alone.” - the majority of books about this case have been written by conspiracy advocates – was financial gain the reason they wrote their books? Amen about Moldea and Ayton, I definitely agree with you on that. But I part ways with your point about physical evidence of a second gunman. I just saw the TV show about the tape recording and was very impressed with the physical evidence presented! As far as I'm concerned the only thing good about this HNN article is its web link to the video so we can all see the program for ourselves and reach our own judgement! Valerie Schulte was wearing a green dress that night and was limping around in a cast. No mention of a girl wearing a green dress or on crutches in Vince's interview just hours after the shooting. On the other hand, there is great detail of a girl in a white dress and black polka dots holding on to Sirhan at the tray rack just prior to Senator Kennedy's entrance. Jack Merrit, the security guard saw her as well. "Merrit stated that he drew his gun and ran into the pantry in time to see two men struggling with Sirhan. He phoned the police and for an ambulance. He stated that when he first entered the pantry, he observed two men and a woman walking away from him and out of the kitchen. THEY SEEMED TO BE SMILING. He added that the woman was wearing a polka dot dress." My question is who were the two men with this woman who accompanied Sirhan? Did Sirhan Sirhan act alone? This has been at the center of the conspiracy debate. It is believed that there was a second gunman escorting RFK and that this person shot RFK behind the right ear and under the right armpit firing a total of 3 shots from a .22 caliber handgun. At Sirhan’s trial, the ballistics was never examined, so everyone believed that Sirhan’s shots killed RFK. The second handgun disappeared and has not been available for tests until now. The handgun was initially recovered in 1993 and is now back in California after 39 years waiting testing by the state DOJ. It was registered in California on May 27, 2007 (SN: Y13222, 9-shot, .22 caliber, HR). The alleged second gunman has been named in various books and articles and is alive and living outside of the US. If you'll permit may to say so, I have viewed this Discovery Times documentary on YouTube and I, for one, find it utterly fascinating. I highly recommend it. So I just wanted to offer that information to everyone. Di Pierro also takes issue with conspiracy writers who insist Sirhan was never close enough to RFK to fire at point blank range. DiPierro insists that Sirhan was much closer to Kennedy, with arm extended, and that Kennedy turned, thereby conforming to the autopsy report. Like Mel Ayton I too have spent a considerable amount of time at the California State Archives in Sacramento, CA. On my last trip I listned to a 4A.M. tape recording of Vince di Pierro being interviewed by homicide detectives of the LAPD. He was a part time waiter and full time student who walked into the pantry with RFK after his speech. As they entered Vince looked down the corridor twenty feet and saw a beautiful, well built girl with her arms around a young man who was standing on a tray rack. They were smiling at each other and when RFK entered the pantry the girl said something to the young man who turned to look at RFK and then dismounted from the tray rack. The young man was Sirhan Sirhan. Vince described the girl to the detectives as, "She was wearing a white dress with - it looked like either black or dark violet polka dots on it and kind of a bively [phonetic] like collar." I always wondered who she was and whatever happened to her.